NASA Coalition presidential candidate Raila Odinga (R) with and his running mate Kalonzo Musyoka and Moses Wetangula at the supreme court for the proceedings of the presidential election petition they filed on August 28 2017. Courtesy photo. Kenya’s Supreme Court has nulified Uhuru Kenyatta’s re-election as President in the August 8 poll. 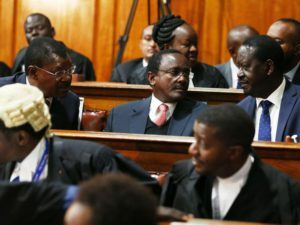 Four judges ruled in favour of National Super Alliance )NASA) presidential candidate, Raila Odinga’s petition challenging the results, while two – Njoki Ndung’u and Jackton Ojwang – ruled against. This means that fresh elections must be held within 60 days after invalidation of the presidential poll. Making the ruling on Friday, Chief Justice David Maraga said the Interim Electoral and Bourndaries Commission (IEBC) failed, neglected or refused to conduct the election in keeping with laws. But he also noted that the court found no evidence of misconduct on the part of the third respondent, President Uhuru Kenyatta. In her minority ruling, Justice Ndung’u said the election was conducted in accordance with constitution, Justice Ojwang’ said the petitioner did not provide enough evidence. According to the IEBC, Uhuru won the August 8 election by 1.4 million votes. Last night the judges, aided by 40 experts, were burning the midnight oil at Nairobi’s Windsor Hotel, writing the judgement. In anticipation of sporadic violence after the ruling, security has been heightened with major deployments and anti-riot and crowd control. During their submissions, NASA lawyers said the election results declared were not based on evidence as they cited mismatches of results in Forms 34B and the IEBC online portal. Lead counsel for the petitioner, James Orengo and Otiende Amollo outlined the “glaring errors” in IEBC forms that led to a rigged election. Orengo said the forms issued to them and the Supreme Court do not match with their respective constituencies. But Uhuru’s lawyers asked the Supreme Court to dismiss the NASA petition saying they were based on hearsay with no evidence. “Hold some arguments with a belt and suspender … it is about the vote. Courts cannot demand voter certainty. The essence of this election is whether the voters voted,” Ahmednasir Abdullahi said. East Africa’s biggest economy has a history of disputed elections and political violence. Odinga has contested the last three elections and lost each time. His claims of rigging after defeat in 2007 elections prompted rioting and retaliation by security forces, which tipped the country into its worst crisis for decades. About 1,200 people were killed in the campaign of ethnic violence that followed. Raila Odinga’s in Kibera, Nairobi celebrate the Supreme Court ruling nullifying Uhuru Kenyatta’s election. Agencies picture. This time, his team focused on proving that the process for tallying and transmitting results was flawed, rather than proving how much of the vote was rigged. Only days after the poll on August 8, Odinga, 72, vowed to “remove” the government of Kenyatta . “We predicted they will steal the election and that’s what happened. We are not done yet. We will not give up,” he told an excited crowd of several thousand gathered on a rubble- and rubbish-strewn wasteland in Kibera, Nairobi’s largest slum and an opposition stronghold. In the first reaction from the government, lawyers for Kenyatta called the supreme court’s decision “very political” but said they would live with the consequences. Human rights groups have said police killed at least 24 people in unrest that followed the vote. 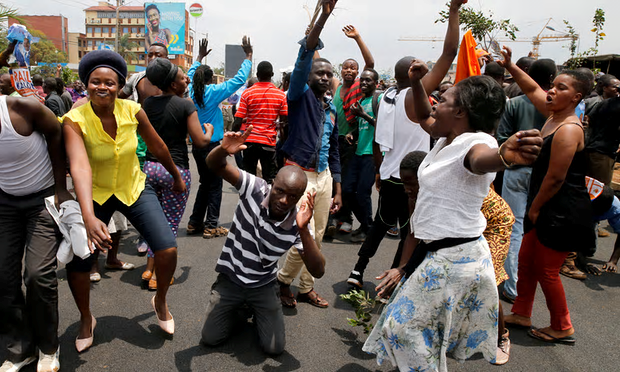 Kenya was braced for further protests on Friday and police were deployed to sensitive areas of the capital, Nairobi. Security was tight around the courthouse as the judges prepared to rule on the challenge. Concern before the election rose when the official who oversaw the electronic voting system was found tortured and killed days before the vote. The electoral commission has said there was a hacking attempt as votes were being counted and compiled but it failed. Observers saw last month’s poll as the final act of a dynastic rivalry between the families of Kenyatta, 55, and Odinga that has lasted more than half a century. The candidates’ fathers, Jomo Kenyatta and Jaramogi Odinga, having been allies in the struggle for independence from Britain, later became bitter rivals.